Your social media team works hard. They keep your content chugging along and build your network on LinkedIn and Facebook, they engage your brand fans in innovative ways on Twitter. They educate your followers on YouTube and capture and share company moments on Instagram. These are just a handful of the channels that keep your social team busy. This article is going to discuss 3 ways the addition of a private, online customer community can help boost your brand, provide some focus for your social team, and make life easier for your customers. 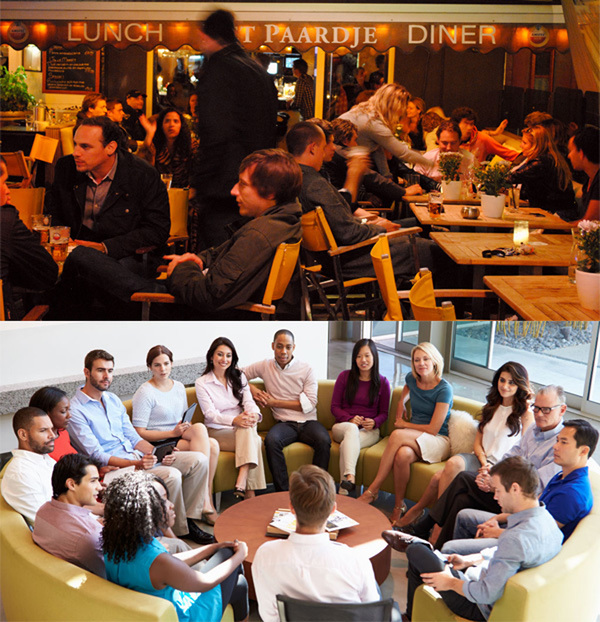 Imagine for a second, the difference in your communication style when in the middle of a crowded restaurant with a large table of distracted people vs when you are part of a small focus group in a conference room where you can hear yourself think. If you're anything like me, in the restaurant, my eyes start to dart anxiously back and forth between all of the people that have paired up and are chatting loudly with each other about different topics. I struggle to catch a couple of sentences here and there and holler in an interjection when possible. While jumping between conversations, I spend a lot of time trying to remember what I want to order, then the table next to us erupts in loud cheering because they are there for a party. When the server shows up to ask what I'd like, I go blank, have to stop everything and pull out the menu again and by the time I get back to the conversation, the topic has completely moved on. The level of information and stimulation overload in a bustling, loud restaurant makes it very hard to stay directly engaged. Whereas in the conference room, everyone is a part of the same conversation, someone responsible is probably taking notes. Everyone is able to be thoroughly committed, taking in and fully considering all of the ideas presented and offering additive perceptions and solutions when relevant. Just the same, the conversations you'd have in a pubic social domain are much wider, more noisy, and less specific than what you would say to your direct, captivated audience in a privately owned network. Let's dive a little deeper into audience with the restaurant and conference room analogy. In the restaurant, you are already part of a large group of people that love eating at that restaurant. There are hundreds of people around you that you don't know…yet. There is a great possibility that someone might overhear a conversation from your table and come and introduce themselves. There is an equal chance that an additional group may walk in and some of your table might leave to join theirs. The popular social networks are similar to that restaurant wherein so many people already exist and are comfortable within the space, and you might be able to grab the attention of several of them, but you may just as quickly lose the attention of others. Now the conference room, these are typically located inside a place of business. Your focus group is seated at the table, and most likely the only people that walk into the room are going to be coworkers, partners, or customers that are interested in or have something to add to what you are discussing. Several of them would probably be able to contribute ideas that could help your group iterate on their concepts. Most importantly, your competitors aren't going to walk in there and take off with the people that are engaged in that conversation. On a public social network, when targeting a message to a defined audience, it's done in the form of paid targeting or advertising. One of the primary goals of a private online community is to allow people to organize by their interests or defining characteristics, and find others that share their same enthusiasms and concerns. When customers self-organize in this way, it makes it even easier to make sure the right groups of people receive the most relevant information. An online community is able to be a one-stop place to accomplish all of the things that each of the different social media accounts does for your company but in a much more precise fashion. Community members are able to interact with content, videos, images, and blogs that are all able to be stored directly inside of the community which makes it easy for users to find if searching for something particular. More so, an online community is able to be customized to the point where it looks and feels just like your website because your company owns and controls the space. When doing a Google search for Social Media Strategy, there are over 40 pages of results. Social media is critical for any business that has a good or service to sell. Of course your company already knows that which is why it is on all of the platforms that your strategic teams have pointed out are necessary for your market. The kicker is that all of your competitors are also on the same channels, fighting for your customer's attention. Your customers also have their personal networks and influences on these same channels. With all of that noise, how do you differentiate? It takes massive creative energy (and time) and a good amount of spend to create effective content and make sure it gets in front of the right sets of eyes on the popular platforms. Even more difficult than getting your message out into the social space is getting your customers to engage with your company on those platforms. According to Rival IQ's 2017 Social Media Industry Benchmark Report, the average rate of engagement on Instagram posts across all industries is 1.66% and on Facebook posts, a mere .17%, and Twitter comes in last with .05%. Engagement is defined as measurable interaction on social media posts, including likes, comments, favorites, retweets, shares, and reactions. How are you possibly going to gather useful feedback or any actionable data for improvement if people simply don't do anything with the information you send out to them? With an online community, your brand is front and center. Your customers come to your community specifically to interact in some way directly with or about your business or products. In a community feed, your messages don't have to fight against distractions like a friend's newborn pictures or news articles that pull attention in different directions. Every time a person enters your community, they will be interacting directly with your brand in some way, even if they are just clicking around. What tends to happen in these focused communities is people start to build trust amongst the people that are similar to them, they ask questions, build on each others ideas, and support each other. Every one of those interactions allows your company to gain insight and better understand these users. "What does a true customer obsessed/customer-centric mindset and experience really look like across not just social media but our online communities as well? They play such a critical part of our total social customer care ecosystem. It's not just about Twitter and Facebook and the messaging apps because the real benefit that we get is really from the one to many aspect of social and the online communities where customers help each other as well as advocates of our product participate in dialogues and conversations and help each other out. How can I grow and scale and amplify the impact of those experts and those advocates in contributing to the Microsoft sort of support ecosystem?" What does community driven scale look like? Kriti believes the opportunity is tremendous and is looking to scale their volunteer advocates and experts from around 1,000 that they have today to millions around the world using online community platforms. Social media is still an absolute necessity and a great way to market your company, products, and services, and to get your brand's voice out into a place where a lot of people already exist. However, in order to ensure people hear that voice and the receive the message, a privately owned customer community is a great place to steer them. — This article is number 4 in our 12-blog Reinvention series. Make sure you don't miss a thing by subscribing to our Newsletter. Curious about online communities, see for yourself: Start a Free Trial of WorkOutLoud!